Timeless Styles Magazine, Silky Smooth Extend Products, Forever Wanted Elixir Products, Skin X Men’s Skincare Products and Vic Stone Solutions Sponsor Beauty Symposium open to the public in Greenville, NC. Sometimes Purpose shifts us into a new horizon, much larger than self. 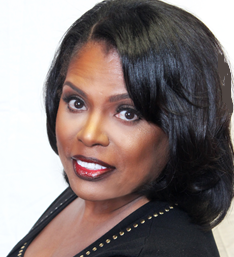 Beauty Industry Guru and Motivational Speaker Carolyn Marshall Covington announced today that she will join the roster of presenting hosts for the upcoming NC Beauty Superstars "Cut-N-Up" Symposium in Greenville, NC. The popular event takes place on Sunday, March 13, 2016 from 2:00 p.m. to 6:00 p.m., and is hosted by Dalas Nixon Turnage at Parish Dior Institute, 212 East Arlington Boulevard, Greenville, NC, 27834. Carolyn Marshall Covington, licensed cosmetologist, instructor, salon & spa owner, consultant and coach, will be a guest speaker for the evening. With over 30 years of experience in the beauty industry, her topic will be from her soon to be released motivational video series titled, Facing Life’s Challenges, while Building your Empire. Carolyn recently revealed that she is facing one of the biggest challenges of her life. For some time she has been battling Retinitis Pigmentosa (RP) a degenerative eye disease. She has begun the transition from behind the chair and has retired from the salon to become a motivational speaker and champion for the fight to end blindness. Carolyn believes that sharing knowledge and experiences through lectures and workshops is a perfect and fulfilling opportunity to stay active in an amazing beauty industry that she has dedicated the majority of her life to. She prays that God will continue to bless her as a leader, a positive role model and a mentor to many. Carolyn has created a foundation, Beauty for Sight, dedicated to finding a cure for Retinitis Pigmentosa and other degenerative eye diseases. Despite the fact that it has caused her to make some adjustments along her dream path, Carolyn is determined to not be defeated by the challenge. She continues to set an example that challenges represent change, and that experiencing those changes can motivate. It can become a reason to press forward and eventually realize that sometimes purpose shifts us into a new horizon, much larger than self. Through faith and tenacity, Carolyn is determined to be the light shining through the darkness that reveals a gleam of hope at the end of the tunnel. Learn more about Carolyn at Carolyn Marshall Covington Motivational Speaker on Facebook. Carolyn would like the Beauty Industry to join her in support of the community that has, and always will, support the beauty profession. Beauty for Sight will be sponsoring national Cut-a-Thons (Cutting in the DARK) and Fantasy Dinner Cruise (Dining in the Dark). A portion of the proceeds will be donated to the Foundation Fighting Blindness. 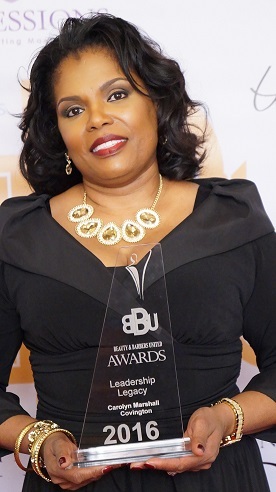 Experience an inspiring presentation by Carolyn Marshall Covington followed byTanya Wilson Cherry - Renew Full Circle presenting "Mind your Business Moment". Beauty industry professionals will participate in various Educational Look-n-Learn seminars presented by Skin X Men’s skincare products with Educational Director, Sherod Holloway, Silky Smooth Extend Blow out Products and Forever Wanted Elixir by Dalas Nixon Turnage. This convergence of talent provides local and visiting professionals with the opportunity to earn N.C. Continuing Education credits (CEUs) from SSG Continuing Education Company and networking opportunities. The evening includes an award presentation to Mrs. Dorothy Wooten by Mary Ann Newton and a host of industry V.I.Ps. Mrs. Wooten will be recognized for 38 years of outstanding dedication to the Beauty Industry. 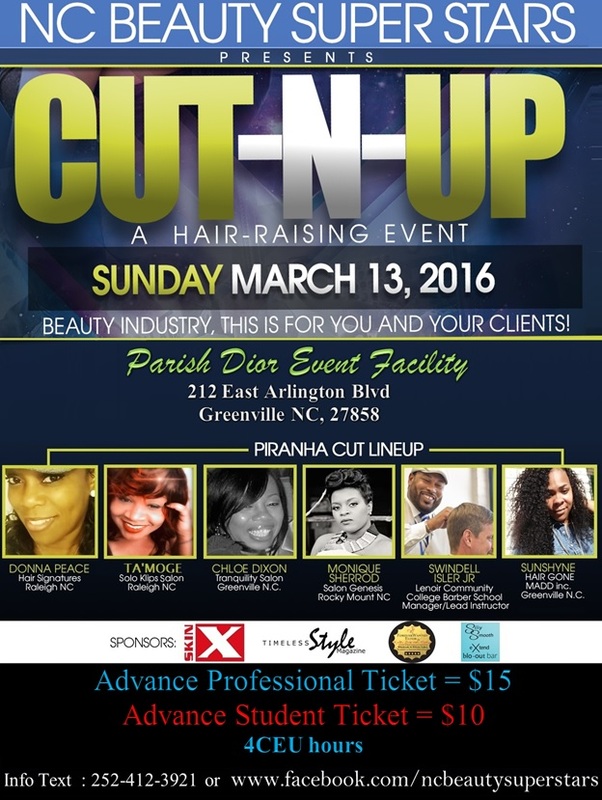 The Piranha’s Team Performance lineup will include Chloe Roberson-Dixon of Tranquility Salon of Greenville NC, Aaron “SunShyne” Ward of Hair Gone Madd Inc. in Greenville N.C., Swindelle Isler Jr., Master Barber/Lead Instructor at Lenoir Community College N.C., Monique Sherod of Salon Genesis in Rocky Mount N.C., Donna Peace of Hair Signatures in Raleigh N.C., and Ta’Moge of Solo Klips in Raleigh N.C. The theme of their performance is "Welcome to Emerald City" …The color is Green represents thr venue city, Greenville NC. Experience outrageously bold hair color, hair raving weaves, fabulous makeup, razor & clipper cuts and natural hair styles. Plan to be there!